Right off the bat, it might just be the cover, but there’s already a lot of reading. I’ve begun to realize that the Thor stories are always a lot of fun, the Fantastic Four are hit-and-miss, Ant Man is just weird, the Hulk is NEVER good but has promise, and I still hate the Human Torch. Here is yet another fun Thor story. Now where’s Mario and his Go-Kart? 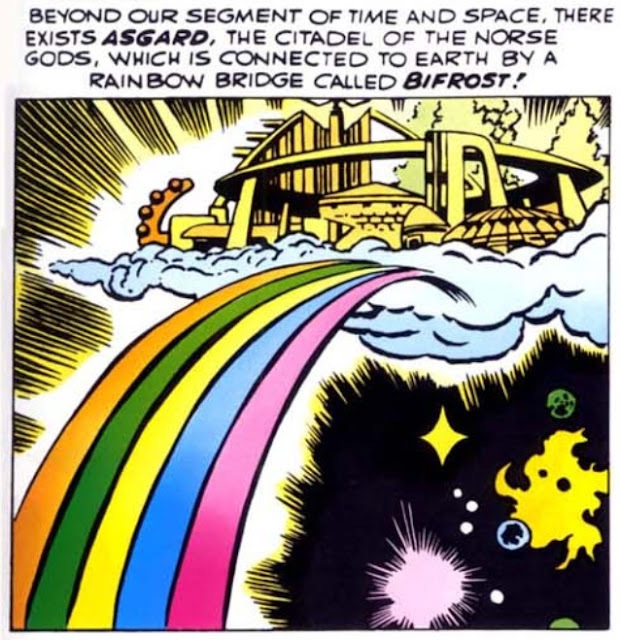 This one begins with the first introduction of Asgard (and the first appearance of the Bifrost Bridge). We get a narration about Loki, Thor’s enemy, who has been locked away for his bad deeds. It’s not your usual prison however, as Loki had been locked inside a tree. The story begins one day when Loki has the BRILLIANT idea of how he can escape. His original curse was that he could not escape unless someone sheds a tear due to his plight. 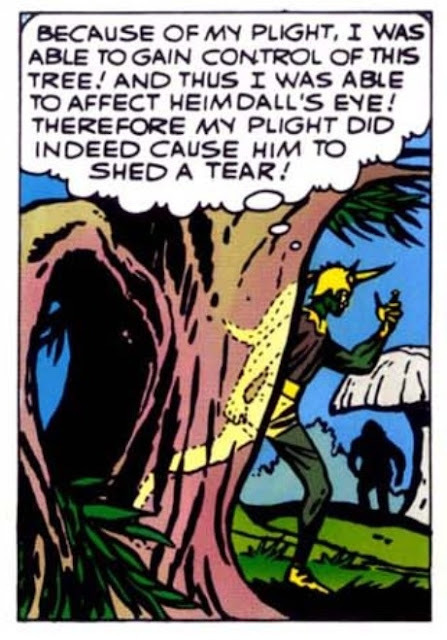 Loki’s idea is to move a tree branch, knocking a leaf into a passerby’s eye, thus causing them to shed a tear. Wow! While it may seem a little cheesy at first, it’s such a brilliantly simplistic way to overcome his obstacle. 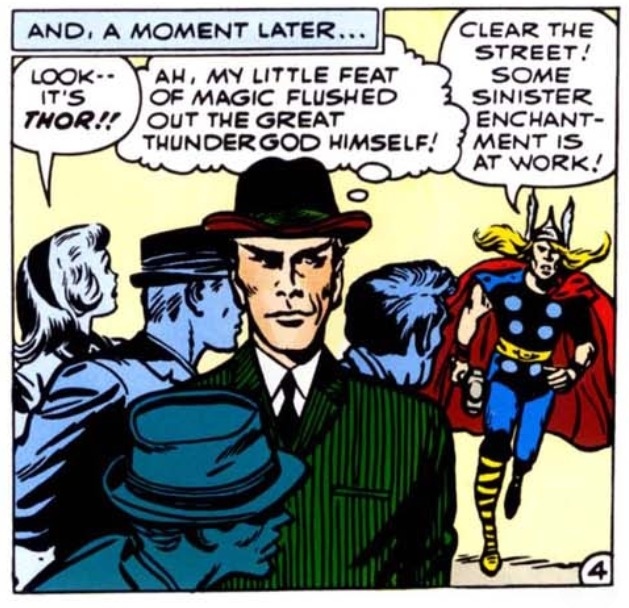 This is great foreshadowing as to the sort of off-kilter ideas that Loki will come up with later on. He’s wickedly insane, but brilliant in his conception of ideas in which to thwart others. This part reminded me of Michael Jackson’s Smooth Criminal video. When Loki follows Thor to Earth, his first idea is to get Thor’s attention. He decides to cause some mischief (after all, he is the God of bad behavior), but instead of doing something predictable, he decides to turn people into negative copies of themselves. In other words: he’s just screwing around! Thor is almost on the scene immediately, and he tells us of a new ability he’s discovered. If you read my thoughts on the first Thor story, I thought it was ridiculous how Don Blake was able to figure out all of the ins and outs to using Thor’s hammer. 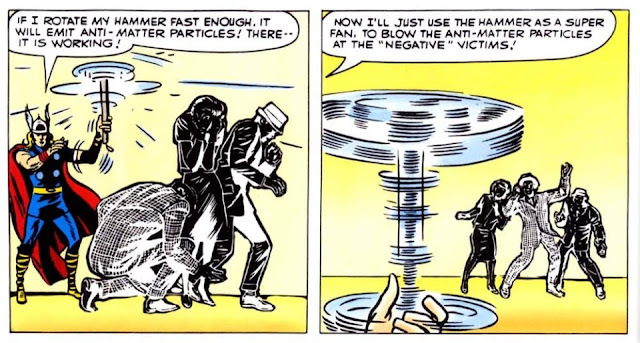 In this one, he reveals that rotating his hammer will emit anti-matter particles. How did he figure this one out?! I was waiting for something incredibly ridiculous to happen, and then I got to this part of the story. Anyhoo, it turns everyone back to normal (though I still don’t know how bad being a negative would have been). There was a panel with Thor confronting Loki that I found very dynamic and exciting amidst the normal Kirby stuff. 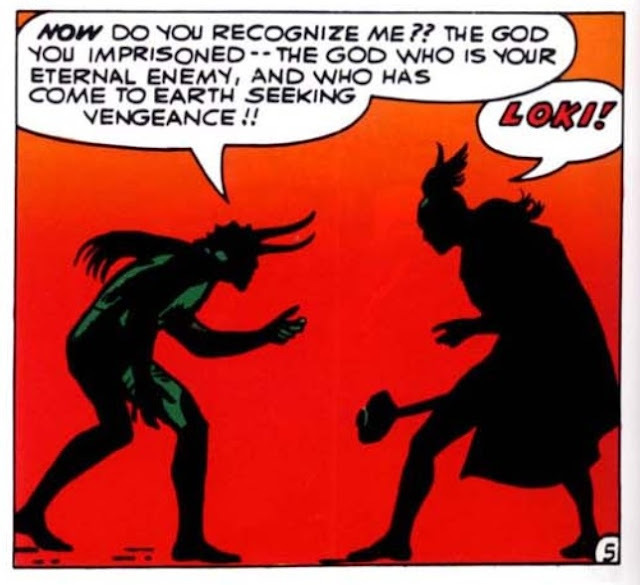 Loki is bending towards Thor with his hand out, almost looking like a bull ready charge, and Thor is posed as if he is apprehensive towards him – all this shown as shadows amidst a red background. This might even be my favorite Kirby panel yet, and is reminiscent of the early fantasy paintings by Frank Frazetta. I would love to see more stuff like this from Kirby, where his broad ink strokes and detail aren’t as dominate as the emotion conveyed by the panel. 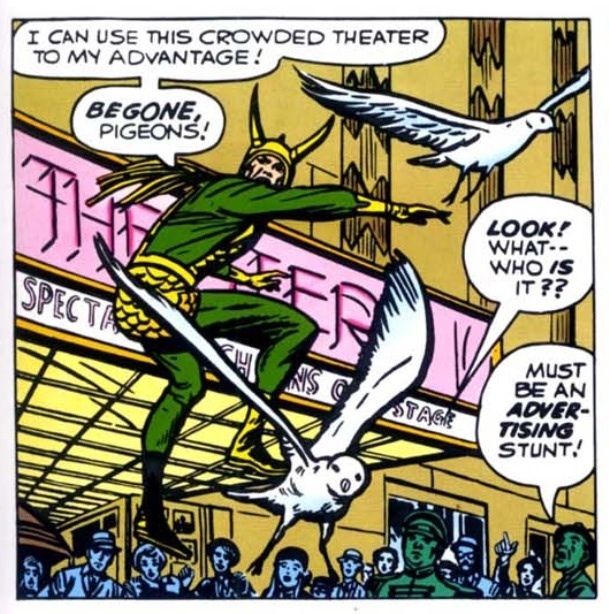 Loki continues to cause chaos around the city, with spectators watching in astonishment instead of fear. That cheesy narration on the bottom: is that supposed to make me bite my nails? 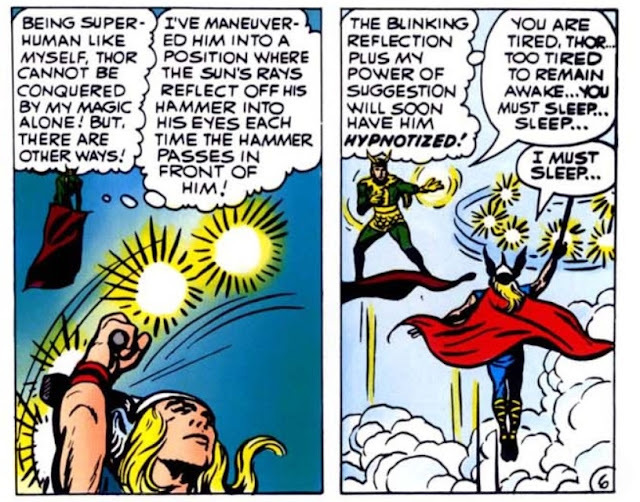 Loki lures Thor into an area where the sun reflects off of his hammer, and the reflection becomes a strobe light as Thor swings it around. This puts Loki in the position of hypnotizing Thor in order to get him to abandon his hammer. Loki continues different (and crazy) ways of getting Thor to lose his hammer, but in the end he’s unsuccessful. 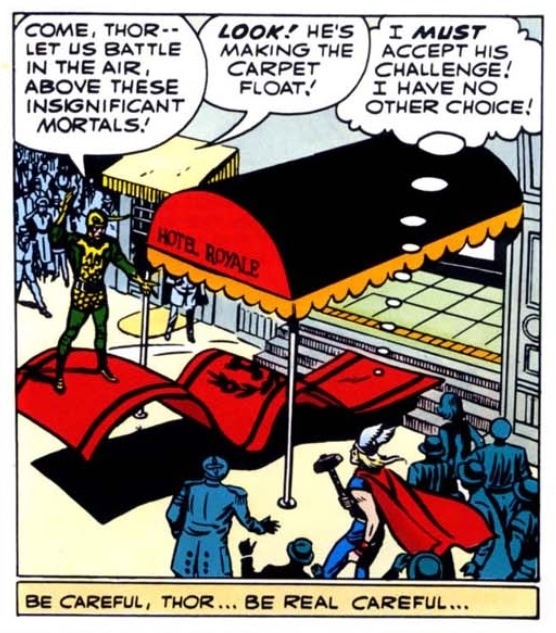 This is probably the most fun sequence in this story, because it seems that no matter what situation Loki puts Thor in, he just can’t seem to win. It’s a difficult concept to convey, but I think they did an amazing job drawing it. 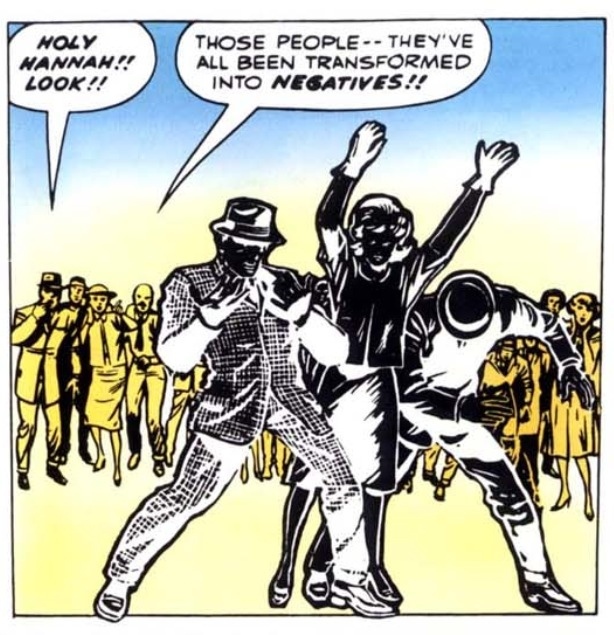 Everything about this panel is amazing. 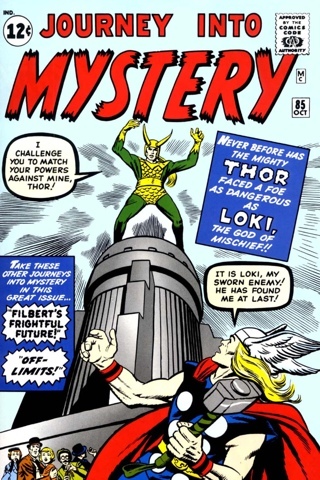 The issue ends with Thor throwing Loki back to Asgard, with the high gods imprisoning him once again. 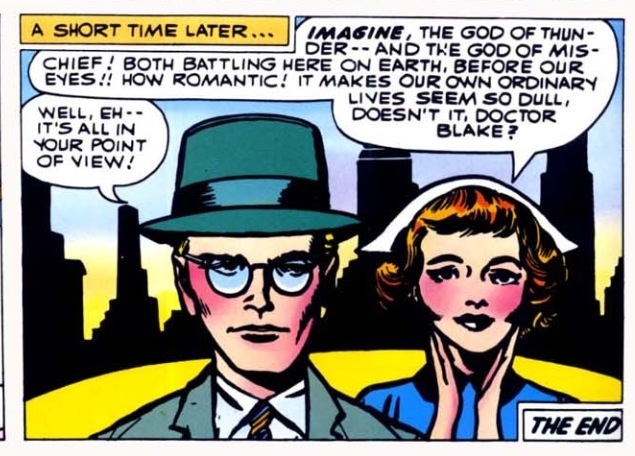 Doctor Blake once again gets the short end of the hammer when his crush continues to swoon over the mighty Thor. Too bad Don, you’re just not the muscle man she’s looking for. When too much blush can be a bad thing.